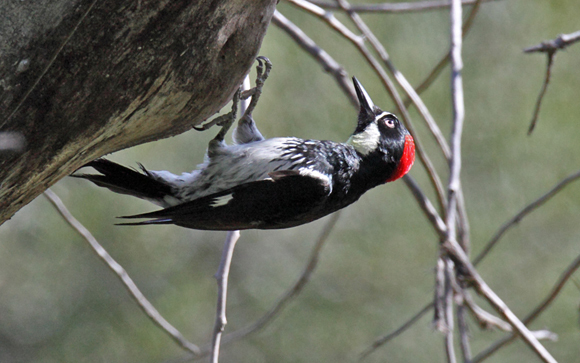 Placerita Canyon Field Trip Report, April 13. We had a good group (around 20) of birders for this trip. The weather was just about perfect too. The only exoskeletal life forms in the pomade were a couple of adults (with an enormous group of boy scouts) who were repairing a park kiosk with power tools. By power tools I mean a huge yellow pickup truck with an air compressor to drive the nail guns and so on. They managed to pack a dozen cars into the picnic area too. All this to fix about a dozen square feet of kiosk roof. 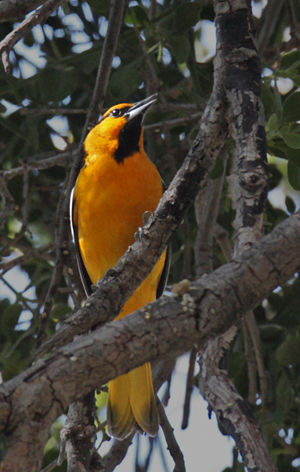 Fortunately we were able to leave the noise behind as we went up the Waterfall Trail and the birds came out to see us. We had a lot of the usual suspects, foremost in number being Acorn Woodpeckers, followed closely by vocalizing House Wrens and Oak Titmice. The birds were apparently trying to drown out the people noise. The highlight of the walk had to be sighting 7 (seven!) different warblers! This is not the most you can see, but asking for more on one trip is just rude. We had to search carefully because most of them were Yellow-rumps, and one flitting warbler looks a lot like another until you pay attention. 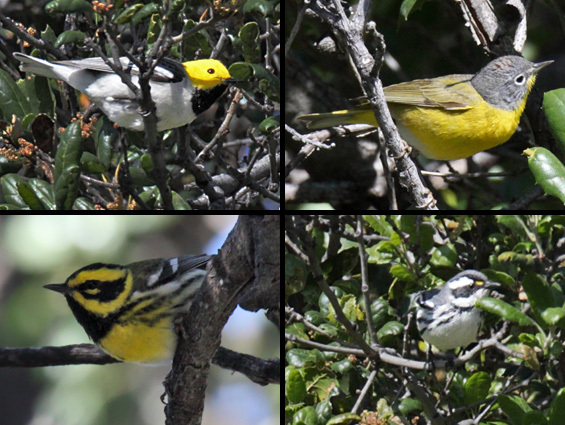 The biggest surprise was probably the Hermit Warbler – a gorgeous male in full breeding plumage. Those of us partial to Townsend’s Warblers had to wait until nearly the end of the trip to find one, and it was the lucky seventh species. After the walk we adjourned to the picnic area down at the Nature Center where a Cooper’s Hawk posed in a nearby tree as we ate our lunches. Recommendation: go to Placerita on a weekday if you can to avoid the crowds. Special thanks to Scott Baker for all the photos!